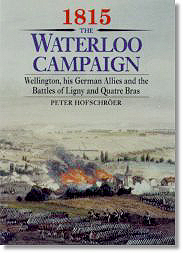 Hofschröer, Peter.1815: The Waterloo Campaign. Wellington, His German Allies and the Battles of Ligny and Quatre Bras. London: Greenhill, 1998. 432 pages. ISBN# 1853673048. $49.95. Hardcover. I am not one for 'revisionist history,' especially the kind that either uses dubious sources, or no sources at all. However, there is excellent research and scholarship being done today that is resulting in excellent work being published that is broadening our view and collective knowledge of the Napoleonic period. Colonel John Elting recommended this book to me with the comment that the author is probably the best researcher at work today. Based on that recommendation, I bought and read the book, and its companion, Waterloo: The German Victory. I was not disappointed. Both are excellent, and should definitely be on the bookshelf of every Napoleonic historian and enthusiast, if only to demonstrate how to thoroughly research and write a book. This is not a book based on Wellington-bashing. This is a carefully researched study of the Waterloo campaign based on largely unused or ignored German sources. Hofschröer gives us a much more rounded picture of the campaign, the Prussian Army, the other German contingents in the campaign, and he dispels many cherished myths and misconceptions that have been told and retold down through the years. The author does not write as an exultant Prussian enthusiast, but rather as a conscientious historian who is trying to find out exactly what happened in mid-June 1815 in Belgium. He tells the story, warts and all, for the Prussians as well as Wellington. His recounting of the Saxon mutiny is thoughtful, well done, and thorough, as well as the other problems the Prussians faced, and it is a very careful account. The book has what is essentially a 'cast of characters' in the front, introducing us to the major British, Dutch-Belgian, and Prussian players of the campaign. Much interesting information on the background to the campaign and the Prussian Army follow, as well as very interesting and valuable text on Wellington and the Germans. The campaign is then launched into with vigor and gusto, and it is a mighty tale that doesn¹t let go and is, in my opinion, quite a page-turner. I didn't care for the chapter subdivisions at all, and these did detract somewhat from the flow of the book, but that is a personal preference vice an overall critique. I also bought the book to see what all the uproar was about. There was quite a bit of wailing and gnashing of teeth about the 'slant' of the book, and of it being 'revisionist history.' Quite frankly, I can't see what all the whoop-de-do was about. Having seen some of the ruder reviews, which I thought uncalled for, I had visions of another David Hamilton-Williams fiasco. This book is no such thing —it is an honest effort by a credible historian, and the quite literal 'tempest in a teapot' was, in my judgment, ridiculous. This book is a keeper, and along with its sequel have formed a new cornerstone in the structure that is Napoleonic scholarship. Both of the volumes have added immensely to our knowledge; our 'quiver' now has two more arrows in it. If you don't have it, or at least haven't read it, then you are definitely missing out on an intellectual treat. In all fairness, it should be noted that the author and I have crossed swords on the Forum occasionally, and we seldom agree or get along, undoubtedly to our mutual disadvantage. That unfortunate situation, however, has nothing whatsoever to do with this review.